With an ever-growing number of Apple computer system users in both homes and businesses, there is a greater need than ever before for tax preparation software for Mac OSX. They can really ease the pain of submitting State and Federal income tax forms. Unless you're completing a very basic 1040 or 1040 EZ Fed tax status, you need all the assistance you can get to help with preparation taxes on your Mac with ease and precision. The two primary apps for Mac tax prep are Intuit's longstanding TurboTax Deluxe and H&R Block's Mac Tax Software - formerly known as 'TaxCut' and 'At Home'. Both programs generally available at retail or for download prior to Thanksgiving to let you get an early start on your 2018 taxes due in April of 2019. NOTE: Self-Employed and Schedule-C filers need to buy the Home & Business edition to unlock Schedule-C and home office deduction features. The Deluxe version no longer does that. While you can pay to upgrade to Intuit's Home & Biz version from inside the Deluxe software if you need to, it's cheaper to buy the full Home & Biz version in the first place. TurboTax Mac 2018 is also available in boxed retail packaging on DVD if you need it. Frankly though, with Apple having discontinued the inclusion of a SuperDrive in any of it's more recent Macintosh desktop and laptop computers, most will simply prefer the downloadable Mac OSX version of the tax software linked above. Like Intuit - H&R Block's Deluxe Fed+State 2018 version doesn't include Schedule-C, rental property and other small biz features. For that you'll need the Premium version. Once you've keyed in your 2018 tax-year Federal income and expense data, and have gone over any of your deductions, the Turbotax or H&R Blog application can likewise assist with State tax prep for those Mac OSX owners who live in states which require them. The crucial data from your Federal filing gets automatically imported into the State portion to ease the procedure. One may then additionally e-File (electronically submit your returns) over the web for faster, paperless filing and getting a return quicker. As will nearly ANY inkjet printer, the initial low-cost of a cheap AirPrint printer doesn't last long. Once either or both of the two ink cartridges run low in your Canon or Hewlett-Packard bargain peripheral, you're faced with a painful choice: Pony up for pricey inks, or just junk the cheap wireless AirPrint compatible printer and buy an entirely new one for around the same price as it's inks. Sadly, cheaper remanufactured carts can be risky as internal electronics are designed by manufacturers to outright reject, fail to properly detect or report ink levels in refilled carts. Best Portable Printer For MacBook Pro or Air? HP's Portable Laptop Printer + Scanner for MacBook Pro or Air made them the first company ever to deliver a mobile print and scan solution for Mac OSX users on the go. This battery powered portable scanner and printer for MacBooks running OSX 10.5 and higher features a color Touch-Screen control panel and both USB 2.0 and wireless AirPrint and WiFi Direct printer connectivity. For an even lighter and more compact portable MacBook combo printer scanner solution, the lightweight Primera Trio MacBook All-In-One is also a good choice - with some tradeoffs over HP's more fully featured but bulkier and heavier mobile print / scan laptop solution. These two MacBook compatible mobile printer scanner combo inkjets have been a long awaited and important Mac accessory for select business users on the road who really need to both print, copy and scan receipts and documents anywhere, any time. The HP 250 or Primera Trio can eliminate the need to carry a separate Mac compatible USB powered mobile scanner. For those who just need mobile printing functions, the HP 200 series laptop printer-only is around $100 less. For other mobile printing and scanning solutions, please visit www.maclaptopprinters.com to find the right Mac computing accessories for travel. Have you been evaluating and shopping for an Apple friendly mobile printing solution for a MacBook laptop computer or iOS handheld device? There's several small, compact and light weight printer choices optimal for mobile professionals working on the go. Just a few companies make Apple compatible mobile printing solution targeted to this consumer space, so choosing on what to purchase is far simpler than needing to evaluate the voluminous number of choices in the broader desktop printing marketplace. Who Manufactures Apple Compatible Travel Printer Solutions? Presently there are only a small number of Apple friendly travel printer makers you need to focus on. Namely, they are Hewlett Packard - HP, Epson, Canon, Primera Technologies and Brother. HP presently makes two battery operated Apple compatible travel printing solution products: One of them is both a printer / scanner / copier combo for both printing and scanning when required. HP's OJ 200 is smaller and lighter but offers print only capabilities. The Office Jet 250 MFP offers both scanning and printing AIO - MFP functions yet is the biggest and most heavy of all the Apple compatible portable printings available. Each provide AirPrint And wireless WiFi Direct compatibility, as well as wired USB connectivity. Epson's current Apple friendly travel printing is the WF - WorkForce 100. It's one of the smaller and light weight designs compared to the competition. It includes a Color LCD display. A internal Lithium Ion battery can trickle charge from either a MacBook Pro or Air laptop's USB port or AC power adapter. Apple compatible portable printing solutions from Brother Inc.
An unusual Apple friendly mobile printing solution is also available for select business requirements. Unlike the other companies, the PockjetJet uses Thermal printer technology to print without ink onto specially coated thermal paper sheets. Various choices for device connectivity include wired USB and optional Bluetooth or AirPrint Wi-Fi depending on which model you opt for. Canon's current portable offering is the IP110 model. It too has AirPrint or WiFi Direct compatibility. Each of the afore mentioned Apple compatible travel printer manufacturers support USB wired printing from a MacBook Air or Pro laptop computer via any standard USB cable. A few also offer AirPrint and wireless Wi-Fi Direct functions as included or an option. Many people evaluating and shopping for an Apple friendly travel printer will also need to print from an IOS phone or iPad tablet. In these environments, AirPrint And Wi-Fi Direct compatibility should be a priority so that your IOS phone or iPad tablet can print easily and wirelessly to an Apple friendly travel printing solution if needed. Primera currently sells a very compact and small Apple friendly portable printer with scanner combo peripheral that weighs less than an 11 inch MacBook Air making it much easier to live with if you're a mobile professional frequently on the road. Sadly, the Primera Trio print / scan / copy combo does NOT have wireless abilities, it's USB only. However, for iPad or iPhone use - it is possible to use Apple's Printer Sharing function on a MacBook to allow an iPhone or iPad to print *through* your laptop via a wireless connection. Although it's USB only and uses just one black OR tri-color ink cart at a time, the Primera Trio All-In-One is an ideal decision for MacBook Air or Pro notebook computer users wanting maximum print, scan, copy functions in a highly compact mobile accessory. Like the Canon IP110, the internal battery is sold separately. But it's much smaller, lighter and fits neatly inside the printer mechanism unobtrusively. Want the ability to watch, record, time-shift and capture live TV on your MacBook, iMac, or Mac mini? Geniatech's U6 USB HDTV tuner stick for MacOS can be a great addition to your Macintosh computer setup. 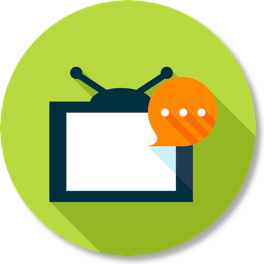 To receive free OTA - Over The Air digital television programming with your Mac compatible HDTV tuner stick, the U6 TV tuner will require either an indoor or outdoor television antenna - depending on your distance from your local television broadcast towers. Hewlett Packard just released updated and revised models of their mobile MacBook compatible printing (and optionally, scanning) solutions. They both now feature USB and WiFi wireless (as well as Bluetooth) MacOS and iOS device printing connectivity. The LiOn battery is now also completely integrated inside the printer instead snapping on the back like an afterthought. The OfficeJet 200 printer features a grayscale 2" LCD control panel, while the multi-function Print-Scan-Copy AIO OfficeJet 250 offers a 2.5" color display. They also print 2-3 times faster than the previous 100 & 150 models. Both these models use HP 62 series Black and Tri-Color cartidges. We strongly recommend always, always buying 62XL high-capacity cartridges!!! You'll get 2x-3x more prints per cartridge at only a 30% price premium. XL is the smart way to go and will save you serious money over the life of your portable HP MacBook printer. Shopping for insanely great Mac computers and accessories at a discount for back to school - college needs? This time of year Apple, Amazon and others offer discounts and deals to help you gear up for education technology. In 2016, Apple is currently offering a set of Beats Solo2 Wireless Headphones if you buy a Mac for college by mid-September. They also offer a free set of Powerbeats2 Wireless Headphones when you buy an iPad PRO model (only) - or an iPhone 6 or 6s (only.) These are a good thing, because frankly young folk like to BLAST their music to people who might not share their audio preferences. But that's what being young is like - not knowing where your sound-space ends and others right not to have to listen to it begins. Kudos to Apple for choosing personal listening headphones as their 2016 Back-To-School promo! Amazon is also featuring back to college deals and discounts for computer technology needed to gear up for the school year with thier Shop Amazon For Off To College promo loaded with Mac compatible accessories and gadgets. For most secondary ed and college bound students, I recommend the ultra-light and ultra slim MacBook Air to ease the pain of lugging around just that much LESS along with their textbooks and whatnot. Select students in certain fields of art and design, architecture and others might really need the added screen space and extra CPU horsepower of a full-blown 15" MacBook Pro laptop, but they may be the exception. Check out these pages of specific MacBook Air peripherals and MacBook Pro accessories that MacGizmoGuy recommends to round-out your Apple compatible computing gadget arsenal. Own a website or blog? Articoolo's instant article generator can be a Mac webmaster's ally in keeping your site fresh and informative. As a browser-based cloud application, you can access Articoolo's article writer from any MacBook, Macintosh desktop or iOS device. Articoolo produces draft-quality articles up to 500 words in 2 to 3 minutes. With a few quick edits and tweaks, you can have fresh content ready to publish in minutes. It costs nothing to generate an article and preview it's content. You only pay about $1 per article if and when you choose to buy it. Visit their site and see for yourself how good computer generated content can be. Shopping for a 2nd generation ThunderBolt 2 docking station? All the major dock peripheral manufacturers have updated their newest ThunderBolt docks to 20Gbps ThunderBolt 2 chipsets and added other refinements. Some of the Apple ThunderBolt 2 docks have seen port changes and enclosure redesigns as they've been revised. Depending on whether the new docks are from Belkin, Matrox, ElGato, OWC or others - you may or may no longer have FireWire 800 or eSATA connectors. Higher power USB 3.0 ports may be offered to better support charging high-demand USB devices like Apple iPad tablets. Others have shifted from DVI to HDMI as the supported video out as vendors strive to match their docking hardware with the kinds of I/O interfaces most currently in demand. With the introduction of the 12-Inch MacBook with Retina Display , Apple is delivering the first Macintosh system with the next-generation of USB connector. The USB 'Type-C' interface provides the new non-directional, reversible plug for hassle-free device connectivity. 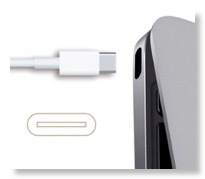 The Type-C jack also replaces MagSafe as the charging port as well. It's important to note though that Apple's implementation is just the 1st revision of the USB 3.1 standard. Rev 1 means any new devices connected to it will still operate at USB 3.0's 5Gbps speed. It won't be until full USB 3.1 SuperSpeed+ (Plus) chipsets are used in future Macs that the data transfer rates will bump up to SS+ 10Gbps speeds - and on a par with 1st generation Apple ThunderBolt devices. In a way, that's okay. Very few Apple computer peripherals need or can even come close to maxing out a 5Gbps USB connection anyway. Really, only multi-drive RAID storage arrays and 4K video displays need that kind of bandwidth. (And in particular - PCIe based solid-state drive arrays.) As such, expect the industry-wide rollout of SuperSpeed+ to 10Gbps to be a slow one. It remains to be seen if, how and when Apple implements it across their MacBook and desktop line in the year ahead. Shopping for a Mac OSX and iOS Airprint compatible laser printer on the cheap? Brother has long delivered great value in affordable monochrome laser printers. With the Apple-friendly HL-L2340DW compact laser printer, duplex printing and wireless networking can be had for well under $100 USD -- and it's an absolute bargain on every level for cheap, reliable printouts. It's what consumers want, and that puts it high on Amazon's Top-100 Best-Seller list for good reason. Plunk one of these in the middle of your home or business - and ANY Apple, Windows or Android device will easily print to it wirelessly. Sure it only prints black and white. For the rarer times where you actually NEED color. you can always have a secondary ink-sucking color inkjet photo printer when needed. Epson recently joined the ranks of computer peripheral companies offering a lightweight and compact WiFi travel printer for Mac OSX and Apple IOS. The Epson WF-100 is now the smallest and most portable mobile printing solution for Apple users on the go. This 3.5 pound printer offers an LCD display control panel, USB and WiFi connectivity, and a Lithium Ion battery that's rechargeable via AC adapter (included) or from your MacBook's USB port when needed. Easily print from an Apple iPad, iPhone, tablets, smartphones as well as PC or Mac laptops. For a listing of all the Apple compatible mobile printing solutions available: Visit http://www.maclaptopprinters.com to see what's available from HP, Canon and Epson.